My Blog is a story of my daily journey with my friends and pets. Tuesday was as usual my rug hooking group at the Country Loft. There is also a Primitive rug hooking group that Donna runs that's lots of fun once a month. 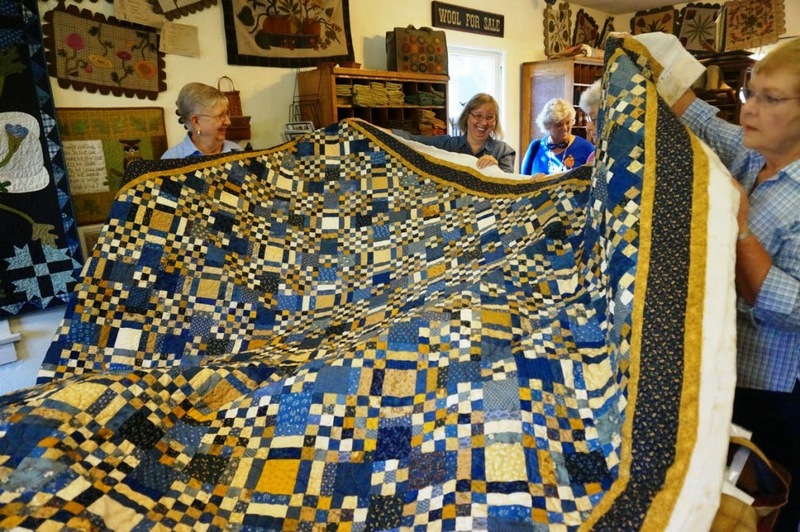 This first picture is of a fifteen dollar quilt that Janice found at a thrift store already quilted that just needs some binding. Wow! Enjoy the pictures of what we have been up to on Tuesday at the Country Loft. Solitude and a cold misty damp day is something to treasure in the fall. A good friend and I were off to Julian a little mountain town in Southern California this week. This time of year it seems the only way we get a touch of fall in San Diego county is to travel up to Julian. I have such happy memories that awake in my heart any time I travel there. My Dad and I were always going up there in my Dad's old red truck driving with a load of lumber or a bag of cement to his cabins on Mile High Road which was about three miles from the main town of Julian. It was a ritual of spring and summer after his day job with the navy my Dad zipping along on the windy road in his old red work truck. My Dad would know every curve by heart as he drove up to the cabins in the Cuyamaca mountains. He was such a hard worker! When I got back from living in Sheridan Wyoming I missed the rural life. So my Dad let hubby and I build a small one room cabin below his main cabin at the top of the world. It was my one room Thoreau cabin minus the Walden pond. I found a antique stained glass window that I fought to have them frame in to the cabin.My dad thought it was foolish and would let the cold in since it was old but I had my way. If it was going to be a little cabin at least it would be unique. The sweet stained glass window was above the large back window.It was the first thing you saw when you opened the door to my country cabin.I remember the rays of sun and colors that shot out from the window were so pretty in the fall. The large back window view was of a group of apple trees my parents had planted. It was my little Heaven. We were all there every other weekend working on the small little blue cabin with the white shutters. My Dad and I were the dreamers and poor hubby had to do the work.My hubby was a saint as my parents got older he would keep all the weeds down for all the property for my parents .Rattlesnakes were always a concern so that was important to keep up with. My dad made a separate road and gate below his top cabin for us. On the weekends we would open the gate to get to our tucked away little cabin. When we had the cabin built my cousin who was a contractor framed everything and then hubby did the rest.I remember Jack up on the tall roof learning how to be a roofer. My Dad took Jack under his wing and taught him all sorts of carpentry skills.My brothers weren't interested in working on cabins and so it was my hubby that got the time with my father that bonded them as men. My dad would get a cup of coffee at his cabin and then walk down the steep rock stairs to our little cabin then we would sit under the huge oak tree and look at the view of trees and little tops of cabin roofs in the distance. My father had a friend at a near by cabin loan him a donkey for Megan for the weekend. So all weekend there was that donkey outside my little blue cabin under the oak tree. All I can say is there were tears at the end of the weekend as the donkey was walked slowly home. The little cabin is gone now it was sold when my mother sold the cabins and property after my fathers death almost twenty years ago. About six or seven years ago the Cedar Fire went through the area where the cabins were and everything burned up in a couple of hours. Jack and I drove up there after it happened and found a small piece of stained glass melted into a glob it now sits in my china cabinet a reminder to me to my little sweet cabin . I may not have that little cabin anymore but what I learned in those times planning and working on that little cabin has given me a appreciation of what's truly important. The end was not what I expected but some people never have those memories and boy I am so lucky a person to have enjoyed those happy times and yet learned the most valuable lesson. Life is a journey and I wouldn't trade that time with my father for all the cabins in the world. The cabin was just a tool the good Lord gave me to have that time with my family and I will have that in my heart when I think of all the hours I was given to be with my loved ones. Jack has and just picture the biggest Bubble!! So as Linda drove down the road I watched the scenery swirl by and thought of such perfect times. Between the windy road with all the changing fall colors and the Apple cider it was a perfect day . We saw a group of wild turkeys right after we got back on the road after I had taken these pictures of Cuyamaca lake. In Julian which use to be an old gold mining town the main theme is Apple pies there are an endless variety of apple pies to choose from. Except this year a lot of the apple orchards are closed. Families can't pick apples because there are fewer apples because of the drought in California. So it seems.as long as your happy with just buying pie and not picking apples you will be content in Julian . Talk about happiness it was overcast cold enough for a sweater and believe it or not sometimes sunshine is over rated . It felt wonderful to be bundling up walking into the nut shop and tasting the boysenberry apple cider. One of the places we visited was a new knit shop in Julian and a bird watching shop.The Cider nut store is a must! Free samples of apple cider.We had lunch and stopped in at a couple more shops before we left.If your a knitter be sure and stop at Kat's. This darling knit shop is now located in Julian. Linda was really busy shopping for Christmas and I saw some wool yarn I thought maybe I could use it in a hooked rug. Ever since I saw how someone had accented a hooked rugs with yarn I thought maybe I will try that on one of my rug hookings .We were met by a real nice friendly shop keeper who made you feel right at home. Kat's is tucked away off the Main Street and well worth the visit when your in Julian. I like knit gadgets I had bought this key chain during the yarn crawl last time I was in Julian. This knitting gadget is shaped like a sock with the Kitchener stitch on the back. When I get to the end of a sock I am knitting I always forget that stitch ! What colors should I do the heart? Tuesday is my rug hooking groups can hardly wait! All done I finished it last night and I am so done!! Last weekend was so relaxing I did nothing all day it was wonderful. While checking out blogs I noticed that Notforgotten Farms blog was starting a new rug hooking group .What a great idea another place to check out what other rug hookers have been creating. Lori at Notforgotten farms started a group on face book which quickly grew as hookers jumped in to reach out to others and share what they're doing.It's a great place ask questions get advice and just plain have fun. It was so addicting as hookers typed out their names and locations all over the world to see where everyone was hooking from. The group is called The Out of Hand Rug Hookers. Lori is giving a free pattern to copy called Santa Claws it's a primitive cat with a stocking cap.I better look in my stash pile for some off white. I didn't get much done between watching Lori's group explode with hookers and between pinning on my Pinterest on Sunday. I have been trying to collect as many pictures of primitive hooked rugs on my Pinterest site . I love Pinterest it is so addicting . It's like eye candy for anything your interested in. Just click on my Pinterest button on my site and you'll see all sorts of goodies from antiques to recipes. I have a lot of hooked rugs I have found while checking out Pinterest. Sometimes I am looking at different color combinations in a hooked rug . It helps when I am hooking instead of having to tear wool out because I don't like the color combinations. I think if you hook something and don't like the colors in your rug then just tear out the wool because it's always going to bug you . did I say eating and sleeping all day. I finished my rug and now I have a couple more I want to do I am obsessed lately I keep finding rug patterns that I want to hook.I have three I want to do right now which is a lot for me! me.It's never too late to love native plants. Take off your shoes grab a cup of tea picture yourself sitting in a girlfriends home and just relax. It's fall at Dee's home. Monday I went over to show her how my primitive hook rugs are progressing and as usual my friend Dee was so encouraging of my rugs We both love to share what were working on and always I get great ideas to run home with. Dee has a great personality she is so bubbly has a great laugh! I love having friends with such positive ways of looking at Life.Like all of us bloggers she has so much enthusiasm for all her projects it can't help but rub off on you. From Dee's love for finding a good thrift store bargain to her endless stream of friends and family that visit her home she is truly a blessed woman Dee doesn't carve as much as she use to but she still whittles a heart or a pumpkin or two.I brought over a succulent plant for her to enjoy in her garden. We both seem to talk at once when were visiting and always laugh alot. Of course in the middle of talking there is always time for a little cup of orange sherbet and a shortbread cookie. Dee is so lucky when it comes to thrift store shopping she found the cutest chair and touched it up and she loves it. Her warm and comfy home as always is filled with pumpkins this time of year.I loved the pumpkins she carved and the birdhouses she made from scratch.Enjoy! I love this piece of furniture it's really old. © Cheri Larson and www.backtolarkrise.blogspot.com and Larkrise garden girl 2009-present and future posts. Unauthorized use and/or duplication of this material without express and written permission from this blog's author and/or owner is strictly prohibited. Excerpts and links may be used, provided that full and clear credit is given to Cheri Larson (larkrise garden girl) www.backtolarkrise.blogspot.com with appropriate and specific direction to the original content. As you can tell I love the PBS mini series Larkrise to Candleford. Love love Love the show!. Let me list my favorite things to do Gardening, quilting, rug hooking,reading and being a mom grandma and wife. I enjoy playing with my crazy shitzu Maulie who constantly makes me laugh. I have a wonderful creative daughter and a kind son in law and a sweet little grandson Jack. My husband is always woodworking in the garage which I love or playing with his trains. My crazy cat Morris is another member of our family who is the most laid back Orange tabby cat. I believe There is nothing better then working with your hands and finishing projects! !